Today's post is the eighth installment of the Cottage Cooking Club a virtual cooking group started by the talented Andrea of The Kitchen Lioness. We are currently cooking our way through the River Cottage Veg, a cookbook by Hugh Fearnley-Whittingstall. This month I prepared 2 of the 10 recipes that Andrea chose, one from each chapter. The purpose of our group is to incorporate more local and seasonal veggies into our daily meals. For the first recipe I prepared the Corner Shop Spanakopita which reminded me very much of a spinach pie. Caraway seeds were toasted, onions sautéed and then both were combined with spinach that has been wilted, drained, squeezed and then chopped. Thyme was added with a squeeze of fresh lemon, then goat cheese and pine nuts. Puff pastry is rolled over the top of the dish and then into the oven for 25 minutes until golden brown. My husband and I enjoyed this dish very much and I thought that this would make a great dish to bring to a potluck as it was delicious warm and at room temperature. The next dish I prepared was the Curried Red Lentil Soup. Garlic, fresh ginger, red chilies, garam masala and curry powder were the aromatics used in this recipe. I loved the way these spices warmed and brought flavor to this dish. Vegetable stock was then added and simmered until the lentils were soft, about 25 to 30 minutes. I then used a immersion blender. It was creamy and thick, water was used to thin it a bit. Since this was a variation of the original recipe, Curried Sweet Potato Soup I was not sure if I should add the coconut milk. At the last moment I decided not to and thought that it was fantastic. Served soup with a dollop of sour cream and a sprig of cilantro. Recipes have been adapted from the "River Cottage Veg" , cookbook by Hugh Fearnley-Whittingstall. First recipe; chapter Comfort Food & Feasts, Corner Shop Spanakopita, page 54. Second recipe chapter; Hefty Soups, Curried Red Lentil Soup, page 166. Hello Cheri! Nice pics for the month. I did not prepare the spanakopita as yet but plan to. Loved the sweet potato soup, with the coconut milk though, and then transferred this recipe base to preparing curried butternut squash soup, the hot pepper gave it quite a zing enjoyed by all! Wishing you and yours a very Happy New Year 2015! Looking forward to our continued fun preparing dishes with the Cottage Cooking Club! Hi Peggy, you know I was just thinking that we only have 2 more months to go, I'm having so much fun that I don't want this to end. Anyway, this months recipes were great, we loved the heat from the hot pepper too! I love your choices for this month. The spanakopita was a hit in my home too; your maple leaf cutouts are the perfect touch for it and I agree, it would make an excellent potluck dish. The soup is one I didn't get to so I really enjoyed reading your impressions of it....it's been added to my ever growing "to make" list. Thanks Zosia, Cottage Cooking Club has been a great experience, so great to have met you and all the others, great group~! Happy New Year to you and yours! I would gladly eat both dishes you prepared! I have never heard of this book before and I haven't had a spinach pie either. The pie looks and sounds quite exciting, I like the idea of lemon thyme and spinach, although I am not much of a spinach lover, I would happily make this for dinner and satisfy our bellies with your recipe. Thanks for sharing, quite interesting! I wish you already a happy new year! Both dishes look great! I would LOVE yo try your Corner Shop Spanakopita! Thanks Julie and Alesah, spanakopita is now in the monthly rotation. Happy Holidays! Dear Cheri, two wonderful choices for this month and your maple-leaf cut-outs are very pretty. The Spanakopita would certainly be a wonderful dish to bring along to a potluck dinner and the Sweet Potato Soup you prepared looks amazing as well - we loved that one too! 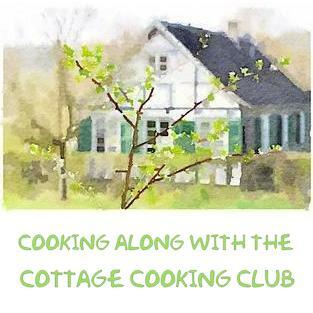 Thank you for your wonderful participation - it makes me very happy to count you as one of our members of the Cottage Cooking Club! Looking very much forward to cooking along with you in the coming year! Wishing you and yours a very Happy and Healthy New Year - "see" you soon! Thanks Andrea, you are so kind, thanks for all you do to keep our cooking group going, Happy New Year! Thanks Angie! Happy New Years! Thanks Marcela! we liked them both, each for completely different reasons. 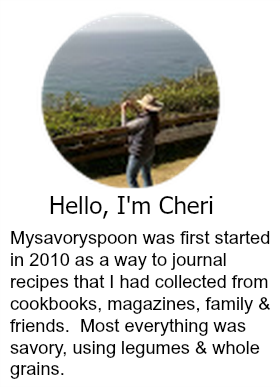 Cheri, both of your dishes look just wonderful! I did not make either, so it's fun to see how these turned out. They both sound delicious!! Thanks Candy, I was down to the wire getting these posted but they were both delicious! Both of those sound really good, and the spinach pie would be great after a bowl of that soup. I've been meaning to make red lentil soup for a while now. Will check if the recipe is available online over here. As I particularly like Hugh's recipes. Having written that, I've never made them! Shock, horror. Hi Johnny, I cheated a little on the red lentil soup and did not add the coconut milk as I make one pretty similar to that already and really liked the Hugh's spice combo. Happy New Years! These are both so unique and yummy sounding. Love that spinach pie. I'm always a sucker for puff pastry! Hi Chris, puff pastry is a weakness of mine as well. Happy New Year! I love both of these recipes - they sound and look delicious. I especially love the look of the spinach pie - and to be honest - I've never used puff pastry. But I want to! Hope you had a lovely holiday. Hi Tricia, love puff pastry, I've tried making my own and did not think that it made much of a difference. Anyway, Happy New Year! Hi Cheri, I love Spinach Pie and yours looks wonderful! You made it so beautiful with the leaf cut outs. I would like to try the other dish. It must be so tasty with the spices you used. Thanks so much for sharing them. Happy New Year! Thanks Shari, the leaf cut outs started out to cover a spot in the crust and you know I just could not add one. Wink! I really love your take on the spanakopita, Cheri ... and it's perfect that it's good both hot and at room temperature. Definitely a great dish for a pot luck! Thanks Helen! Loving Hugh's cookbook. Happy New Year! I haven't made a spinach pie in so long and this has definitely inspired me, Cheri! It looks so good! Thanks Susan, this was such a easy recipe, not quite the traditional way, but delicious! Thanks Charlie, I loved the caraway seeds in the pie, it's not a spice that I use a lot of, but it really worked here. That spinach pie and lentil soup definitely need to be made! I am a huge fan of the flavors in both! Thanks Joanne, it's a great cookbook, only 2 months left. Happy New Year! When I was a girl my grandmothers (both of Sephardic descent) made Spanakopita regularly using homemade filo dough year round and a matzah crust at Passover. You've brought back some wonderful memories for me. Thanks Dena you too! Wondering if you have ever made her recipe, sounds wonderful. Happy New Year! Thank you Ritu, Happy New year to you too! Cheri - both dishes look really good, although I've never had a spanakopita with puff pastry. Sounds nice! Happy New Year!! P.S. - did you get lots of snow last evening in Phoenix? Hi David, the puff pastry made this such a easy dish to prepare. And no we did not get any snow but my sister in Carefree did. Happy New Year!! I will definitely try it with the puff pastry. Still freezing here in Tucson! Actually hit 25° last night! Spanakopita is one of my favourite dishes, so layers spinach and feta in puff pastry has to be equally as good. This is a great cookbook, and your recipes look amazing. I'll be sure to check out what the others made! Thanks Beth, it is a great cookbook! I adore spanakopita - this one looks devine. The red lentil soup also looks good. Happy New Year! Thanks, Happy New Years to you too! Your recipe looks awesome, thanks for sharing! Thanks, Happy New Year Uru!! What a great choice of book to cook through! Every time I pull it off the shelf I find something delicious to try from it. Both of these dishes sound so good. Happy New Year! Hi Lisa, your right it is a great book also, I love his variations for each recipe. Happy New year to you too! Thanks Gwen it was delicious! Happy New Year! I need to look through this River Cottage Veg because it sounds perfect! Great dishes, can't wait to give them a taste! ;) Happy 2015! Thanks Pamela, Happy 2015 to you too! Love it Maureen, you are so funny! Thanks Marcie, it was an easy recipe. I loved the spanakopita too. You are right, it's perfect for a potluck. I love your maple leaf decorations. It's been fun cooking with you. Looking forward to more CCC in 2015. Happy New Year, Cheri! Thanks Betsy, I've enjoyed cooking with you as well. Happy New Year! Both recipes look wonderful, Cheri, but my heart will always be with the Spanakopita as I use my mother's recipe from years ago and it brings back such lovely memories. Thanks Barbara, Happy New Year's to you too! I love being busy in the kitchen too. I love the look of your Spanakopita, now that looks like something that is great to serve any time of the day. Glad to hear that you can serve it at room temperature as well. Wishing you a super 2015! Thanks Bam, cooking relaxes me, it's very calming. Happy New Year's! I'm a lentil fiend too, Happy New Year Betty! Both dishes sound fantastic, Cheri. How would we ever get along without prepared puff pastry? It is most definitely soup weather where I live. Don't know which recipe to try first. Best wishes for a very healthy and happy 2015. Hi Cathy, just saw on the news you guys are in for some more wet weather. Best wishes to you as well! Wow, both of your dishes look so scrumptious, Cheri! I just love all these healthy comfort foods during the cold months. You always bring something new and interesting for me to take away - love the learning experience! I hope your holidays were wonderful, friend. Happy New Year! Thanks Robyn, our holidays were wonderful. Wishing you the best, Happy New Year!! Happy New Year, Cheri! I am cooking up a storm (for me, anyway) with my husband home during this break. I am sure you are doing that tenfold and I love getting a peak at what's cooking in your kitchen. Everything looks great! Thanks Monica, sometimes it's really nice to spend some quiet time at home. Happy New Year to you and your family! Love the leaf cutouts! I made the Curried Sweet Potato Soup - it was my favorite this month. Your version sounds delicious as well. I love the way you decorated the spanakopita - so pretty! I made the sweet potato soup and want to try the lentil version soon, especially after seeing yours. Great inspiration for a healthy and delicious snack, thank you! Spanakopita is the ultimate spinach pie! And kudos to you, Cheri, and the Cottage Cooking Club for inspiring home grown delights! This really looks fantastic. I love all of your recipes, thanks for sharing them with us. I am not sure what looks better but I think I will try the sweet potato soup first. It looks so delicious.